Pearls set into antique and vintage jewelry come in all shapes and sizes, and some of the same terms are used to describe those used in both fine and costume jewelry. Learn how to identify natural and cultured examples along with a number of other pearls and pearl-like substances. This type of pearl can be natural or cultured and comes from both freshwater and saltwater sources. Baroque pearls are asymmetrical in shape and uneven in texture, as opposed to forming a perfectly smooth sphere. While the name derives from the Italian barocco or the Portuguese barroco—both meaning "imperfect pearl"—these pearls were highly popular in the Baroque period and later Renaissance, as well as in the Renaissance Revival in the mid-19th century. In the late 1500s and early 1600s, jewelers often fashioned entire brooches or pendants around a single, large baroque pearl, using it to suggest a fantastically creature's head or body. The term for this shape applies to natural pearls and also glass pearls used in costume jewelry by designers such as Miriam Haskell and Coco Chanel. Less expensive costume jewelry versions were also made from plastic and are very light in weight. The brooch shown here features a blister pearl used as the centerpiece of an Art Nouveau brooch surrounded by enameling and diamond accents. These pearls can be found in both fresh and saltwater mollusks, both naturally occurring and cultured, and they are part of the animal's shell rather than a true pearl. Blisters occurring happen when a piece of mud or other substance serving as a nucleus attaches to the inside of a mollusk's shell. These are usually less uniform in shape since the nucleus was not intentionally set. Cultured versions form around a nucleus glued to this inside of the shell and can vary in shape depending on the shape of the base material. 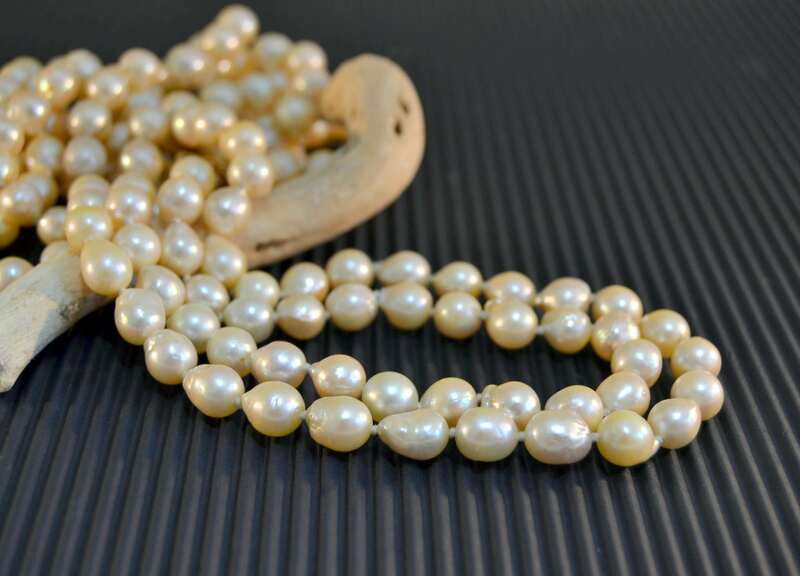 Keep in mind that pearl culturing didn't really take root until the 1920s, so antique pieces dating prior to the Art Deco era are most often made with natural blister pearls rather than cultured. Cultured pearls are those made by inserting an object like a small bit of shell or even a bead into an oyster or clam. Over time, in the same way that natural pearls are formed, layer upon layer of nacre is naturally applied to the intruder by the host mollusk. This process usually takes several years with a cultured pearl whereas a natural pearl may take 10 or so years to form. One of the most important things to remember about cultured pearls in comparison to those made of glass or plastic with a thin coating of pearl finish used in costume jewelry​ is that they will have a gritty feel to them when rubbed on your tooth. Imitation pearls will feel smooth to the tooth. In order to determine whether a pearl is cultured, it must be examined for layers within resembling an onion. Jewelers can do this with a special scope inserted into the hole of a pearl, or by shining a light into the pearl and examining it with a jeweler's loupe. If the core is solid with no layering, then you know it is a cultured pearl. This is a skill that can be tackled at home, but it's wise to get some training from an expert as you're learning to make sure you don't overlook a piece made of valuable natural pearls. Many of the free-form pearls used in antique jewelry pieces are freshwater pearls. In fact, most of them are river pearls that were found in mussels dating from the 1800s onward. Due to the naturally rocky shape of these pearls, they could be used artfully in fine jewelry design. Most modern freshwater pearls are cultivated in lakes and ponds in China. Newer freshwater pearls are more uniform in shape, and not as highly valued as the old, natural river pearls. These newer examples may be incorporated into costume jewelry pieces made with non-precious metals such as gold filled and decorated with simulated gemstones. 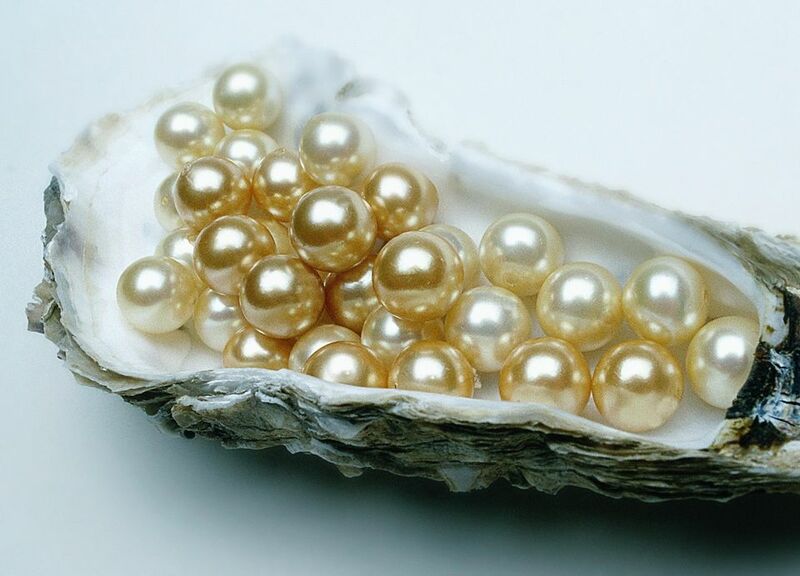 Mabe (pronounced mah-bay) pearls grow similarly to blister pearls, but they are harvested differently. The shell remains in place, but the blister is cut away yielding a domed piece of pearly nacre. Filler is added to the delicate, hollow "pearl" to make it stronger, and it is usually sealed with a piece of mother of pearl or plastic. The body of the swan brooch shown here is an oval-shaped mabe pearl. Many round mabe pearls are set into rings and earrings and often surrounded by diamonds. Natural pearls are those made when a foreign substance makes its way into the shell of a mollusk without out any help (like the assistance they have when cultured pearls are farmed) from man. Over time, layer upon layer of nacre is naturally applied to the intruder by the host oyster or clam, and a pearl takes shape over a decade, give or take a few years. One of the most important things to remember with natural pearls is that they will have a gritty feel to them when rubbed on your tooth. Keep in mind that until the 1920s, most genuine pearls used in fine jewelry manufacture were indeed natural as opposed to cultured. In order to determine whether a pearl is natural, and much more valuable than a farmed cultured pearl, it must be examined for layers within resembling an onion. Jewelers can do this with a special scope inserted into the hole of a pearl, or by shining a light into the pearl and examining it with a jeweler's loupe. This is a skill that can be tackled at home, but it's wise to get some training from an expert as you're learning. One of the rarest pieces of antique Quahog pearl jewelry ever discovered was found in a basket of costume jewelry. It is now named the "Golash Brooch" after Alan Golash. He and a friend purchased the piece made around 1835 for $14 in a Rhode Island antique shop, and it was soon deemed valuable beyond compare. These rare purple pearls come from the Quahog clam. In fact, one was found in a bowl of soup a number of years ago when a Massachusetts police officer was eating seafood stew at a local restaurant. Although it was not nearly as large or vividly colored as the one fitted in the Golash piece, it was still impressive enough to make the news. The rare gem weighing in at six-plus carats is the egg-shaped lavender Quahog pearl shown here. These pearls not nacreous, which means they don’t have the same lustrous finish as other pearls, and the chance of finding a gem quality example is estimated to be one in 2 million. A press release from Kaminski Auctions stated that the desirable pearl sold for $16,500 (including buyer’s premium) in March of 2015, and ultimately ended up with a Japanese collector via an American pearl broker. Seed pearls are tiny examples, round or baroque in shape, that usually measure less than 2mm across. Natural seed pearls were often used to represent tears in Victorian mourning jewelry. Man-made​ seed pearls fashioned of glass or plastic also adorn many different types of costume jewelry.